Gutters on your home are essential for directing water away from your home. They help keep basements dry, protect your siding, and preserve your landscaping. Our custom made gutters are cost-effective and serve as protection for your home or building. Choosing Crane Roofing for your gutter material and installation is a smart bet. Our seamless gutters won’t leak at the seams (a common source of damage) because there are none! Since all our gutters are custom made you will have no problems with odd sizes. Our assortment of colors is sure to coordinate with your exterior colors giving you the best possible combination of protection and attractiveness. Visible cracks on the surface: small cracks can rapidly lead to larger ones and cause damage to your home. 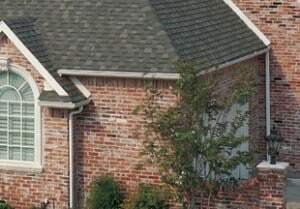 Paint is peeling: leaking water often causes paint on and around gutters to crack and peel. Stains and water marks below gutters. Your gutters are pulling away from your home.